If there is a rable that needs roused then Alan Anderson is your man. Since 1998 Alan has been performing as a stand up comedian at the main comedy venues in the UK and Ireland. A specialist in improvised comedy with audience banter, Alan is regarded as one of the leading compere and warm up acts in Scotland and Northern England. Energetic yet lovable, outspoken but seldom rude, Alan will take any room by the scruff of the neck and entertain it. With almost 800 professional comedy gigs under his belt, Alan regularly comperes gigs which have featured Johnny Vegas, Bernard Manning, Peter Kay, Ross Noble and Jimmy Carr. Most matchdays Alan can be found hosting corporate gigs at some of Scotlands main Rugby and Football grounds. 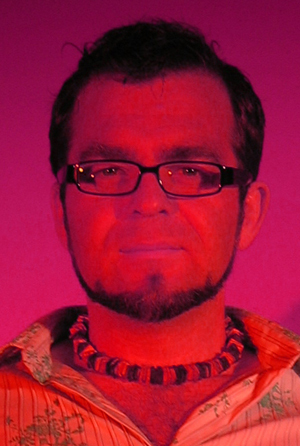 Alan is a founder member of the Steering Committee for the Glasgow International Comedy Festival. .. possibly even something spectacular. Unlike many comedians who flout their prestigious awards, Alan is proud to say that he has never entered a comedy competition in his life. If only he could say the same about Dimitri the Russian fisherman he met in Ullapool. Since 1990 Alan has been filling dance floors up and down the UK. Alan has performed specialist Disco, House and Funk sets at some of the countries biggest clubs including the Haçienda in Manchester, Cream in Liverpool, The Arches in Glasgow and Headling the Old Skool Float at the Radio 1 Love Parade in Leeds playing to over 300,000 clubbers. However his greatest skill is filling dance floors at Corporate Parties and weddings, laying down the finest selection of deep filled Camembert cheesey floor fillers, which are guaranteed to make you, your mum and your boss cheer not cringe.